Stock photo of olives at a market stall in Plaza de la Corredera, City of Cordoba, UNESCO World Heritage Site, Province of Cordoba, Andalusia (Andalucia), Spain, Europe. Green olives in a thin red sauce sit in a pot for display at a market stall, Plaza de la Corredera. This stock photo shows pots of olives at a market stall in Plaza de la Corredera, City of Cordoba, UNESCO World Heritage Site, Province of Cordoba, Andalusia, Spain, Europe. 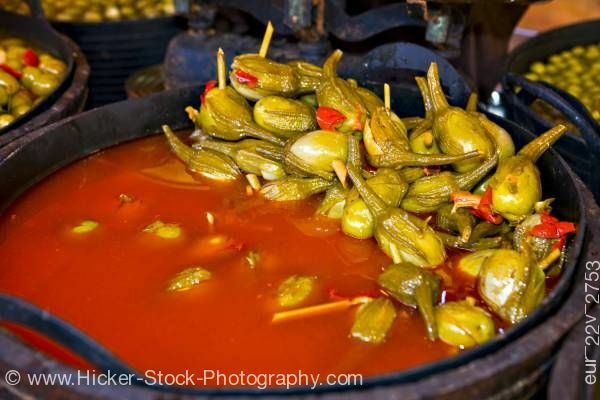 The green olives are in a thin red sauce sit in a black pot with handles for display at a market stall dominates this photo. Some of the olives have red pimentos. This pot is surrounded by sections of other pots with olives in different types of sauces. The wet olives show different shades of green with long dark stems. A grouping has been pushed up to the back side of the pot to reveal the olives out of the sauce. A few olives show only slightly above the sauce. Olives at a market stall in Plaza de la Corredera, City of Cordoba, UNESCO World Heritage Site, Province of Cordoba, Andalusia (Andalucia), Spain, Europe.